It’s always been tough to be a non-conformist in society. From the 17th century Salem “witches” to today’s “kneeling” athletes, those who choose to act outside society’s norms have always risked the scorn and ridicule of the majority. Of course, burning at the stake has been replaced with angry tweets and Facebook sneers, so we have at least tempered our reactions to those who are different or who act differently. With the implementation of the current (1961) zoning resolution, thousands of buildings suddenly no longer conformed to, and/or complied with, zoning regulations. The zoning resolution does address these buildings that were suddenly no longer “as of right.” The text sets parameters for allowing buildings to continue their operations and, in some cases, paths that allow them to retroactively become “as of right.” As the rules are written, there are winners and losers amongst the affected buildings. “Conformance” and “compliance” have distinct meanings when applying the rules of the zoning resolution. A conforming building is one that is used in a manner appropriate for its zoning district. For example, a multiple dwelling located in a residential zone is a conforming building. A factory operating in the same district is non-conforming. A complying building is one where the bulk and siting on the property complies with the bulk and yard regulations for the zoning district. So an existing 70-foot residential building in an R6B district (max height = 50 ft.), while conforming, is non-complying because it exceeds the height limit. Article V of the zoning resolution, titled “Non-Conforming Uses and Non-Complying Buildings,” addresses these issues. Article V is quite kind to non-complying buildings. Buildings that are larger than what current zoning allows can be maintained and even converted to another use without having to adjust their bulk (ZR 54-31). Even if a building requires substantial reconstruction because of a fire, damage, or neglect, the non-compliances can be maintained as long as the reconstructed floor area equals less than 75% of the total (ZR 54-41). Developers can strike gold if they acquire a non-complying, non-conforming building in certain areas of New York City eligible to use Article I, Chapter 5, “Residential Conversion within Existing Building.” Any non-residential building can be converted to residential use where the zoning district allows residential use if the buildings are located in certain community boards in Manhattan, Queens, or Brooklyn (ZR 15-01). A former commercial building that far exceeds the allowable FAR permitted in a residential district may convert all of the building to residential use. According to ZR 15-111, the number of dwelling units that can be created is calculated on the basis of the existing, non-complying floor area—not on maximum permitted floor area, which is the normal procedure. Take, for example, an old factory building of 60,000 s.f., sitting on a 100 ft. x 100 ft. lot in an R6B district. Per ZR 23-145, the maximum FAR = 2.0, which allows for a building of 20,000 s.f. The number of dwelling units permitted in a new development is 20,000/640 (ZR 23-22), which equals 31 dwelling units. Converting the existing building would allow 94 dwelling units (60,000/640). Even More Bonuses . . . In addition, eligible converted buildings get a break on parking requirements. While the maximum number of required spaces that can be waived for a new development in the R6B district is five (ZR 25-261), a converted non-complying building can waive up to 20 spaces (ZR 25-262). The generosity shown to non-complying buildings that want to conform continues as Article I, Chapter 5, also directs the designer to follow MDL 277(b) of the Multiple Dwelling Law for light and air requirements. ZR 23-861 dictates that new developments need to provide a minimum distance of 30 feet between a window and a lot line for the window to meet code-mandated light and air requirements. By contrast, MDL 277(b), which was written specifically for loft conversions, permits light-and-air windows to be as close as five feet to the rear lot line. 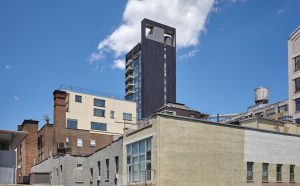 While there are enticing zoning incentives to undertake a renovation of a non-complying building, the same cannot be said when renovating a building that wants to maintain a non-conforming use. Next month, we will explore the limitations and unusual quirks that occur when trying to upgrade a non-conforming building.